This month, we celebrate the 165th anniversary of the New York State Legislature setting aside the land to create Central Park. The intention behind that historic act was to transform rock outcrops, swamps, and marshland into “a public place” that would provide a beautiful and democratic space for all New Yorkers. In the 1840s, New York was the most populous city in the western hemisphere and experiencing its first wave of German and Irish immigrants, who were not always welcomed into the City’s neighborhoods. As diversity multiplied and the downtown population soared, private and gated enclaves, such as St. John’s Park and Gramercy Park, were developed only for the well-to-do residents of surrounding homes. Many social reformers at the time felt that this was inconsistent with American values, and understood that a public park could reverse this alarming situation. 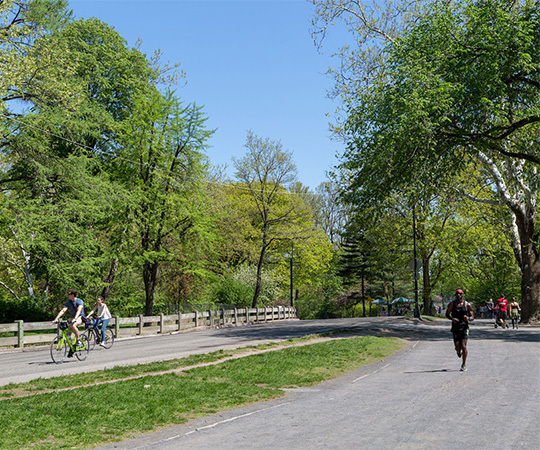 When Frederick Law Olmsted and Calvert Vaux were chosen to plan the new park, they set out to resolve this tear in the social fabric and create a space designed to bring all people together regardless of their backgrounds. You can still find evidence of this vision in the Park’s design today. This month marks the 165th anniversary of the New York State Legislature setting aside the land to create Central Park. The intention behind the Park was to create “a public place” that would provide a beautiful and democratic space for all New Yorkers. Central Park’s homage to all New Yorkers begins, fittingly, at its entrances. That’s where the Park Commissioners honored professions and groups that helped make New York City a great metropolis. The commissioners suggested a naming system at the Park’s four entrances along 59th Street, incorporating four main occupations: Scholars’ Gate (at Fifth Avenue), Artists’ Gate (at Sixth Avenue), Artisans’ Gate (at Seventh Avenue) and Merchants’ Gate (at Eighth Avenue). Nine of the other 18 gates honor professions that played a prominent role in New York City’s history: Pioneers, Farmers, Hunters, Miners, Woodsmen, Mariners, Engineers, Inventors, and Warriors. 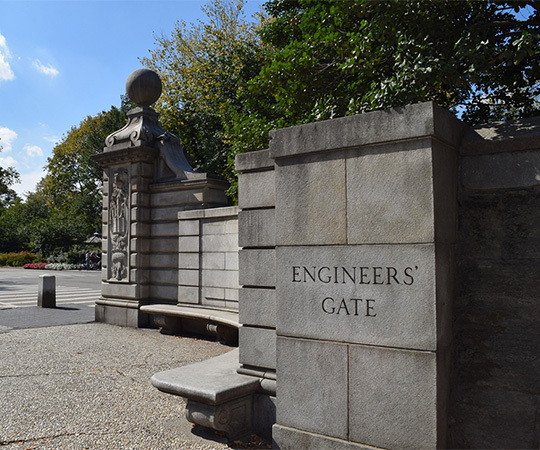 Located at East 90th Street, Engineers’ Gate is one of Central Park’s entrances, which honor groups that were important to New York City’s history. The other gates single out significant members of the population: Women (at West 72nd Street), Boys (at West 100th Street), Girls (at East 102nd Street), and most importantly, Strangers’ Gate, at West 106th Street, for the prominent role immigrants have played in New York City’s development. The City’s ethnic communities began gifting the Park with statues that honored their national heroes, such as German-born poet Johann C.F. von Schiller, Irish poet Thomas Moore, and Scottish author Sir Walter Scott, among others. These sculptures became a reflection of the City’s “melting pot” and the pride each immigrant group felt for the contributions from their cultural and political leaders. A statue of Samuel F.B. Morse, inventor of the wire telegraph, stands outside Inventors’ Gate on Fifth Avenue and 72nd Street. Initially, the Park’s gates were meant to feature statues representing each of the named professions or groups. The original plan was never fully realized, with the exception of Samuel F.B. Morse, the famed inventor of the wire telegraph, at Inventors’ Gate. Inside the Park, Olmsted and Vaux included three different categories of pathways — pedestrian walkways, carriage drives, and a bridle path. In the 19th century, congested City streets posed safety concerns, so separating traffic from pedestrians, carriages, and horses in the Park offered visitors peace of mind as they moved throughout the landscapes. They also ran parallel to one another, allowing visitors of different backgrounds an opportunity to see each other. While the paths entering the Park separated visitors, everyone could join together on the premier walkway in the Park: the Mall. Inspired by the public spaces of Europe, such as Piazza San Marco in Venice and the Champs Élysées in Paris, the Mall was a gathering place to celebrate the City’s diverse populace. Though they preferred more romantic, winding pathways, Olmsted and Vaux designed the Mall as a straight path that would encourage visitors of all classes to commingle, making it a focal point of Central Park’s great democratic experiment. 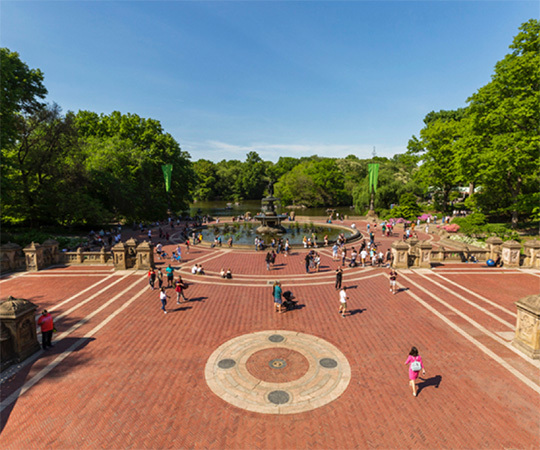 While the City backdrop may have changed, Central Park’s purpose remains the same: to provide a retreat for all visitors who walk through the gates. 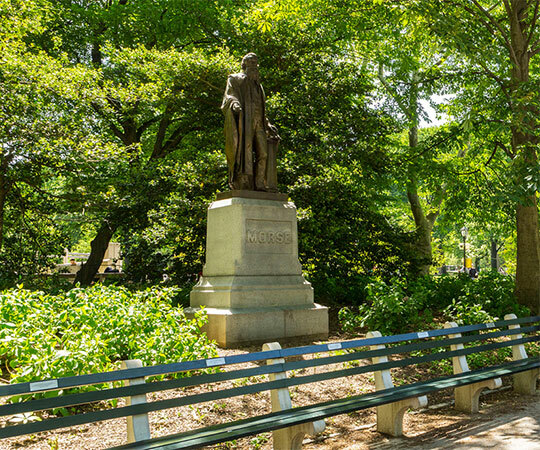 In celebration of the its 165th anniversary, we honor the Park that continues to bring millions of people together today — and give our thanks to you, for helping us care for this sacred New York space.